On 14.03.2014 at 17:30 the Center for international collaboration and projects of the UoS "Episkop Konstantin Preslavski" together with the International Culture Exchange Association in Japan with lector Ms Noriko Ishimaru organized a minifestival of japanese culture in Shumen. The festival attracted a lot of interest and attention in building 1 of the University of Shumen. Students of the free course in japanese, which is held in the university by Ms Noriko Ishimaru, representatives of Shumen's clubs in eastern martial arts - karate, aikido and kendo, students of Bulgaria, Germany, Poland and Denmark from the exchange program of Shumen's Alma Mater, as well as teachers and curious citizens all came to have a taste of the century-old traditions and modern culture of the Land of the Rising Sun. Before them Ms Noriko Ishimaru, along with her friend from Tokio - Mieko and her daughter Naomi Fukazawa showed their skills in ikebana, calligraphy and origami, as well as letting everyone participate in the traditional Japanese cultural activities. Last but not least was the introduction to the signature japanese cuisine, with the dish being prepared for the guests, was made of rice and curry. 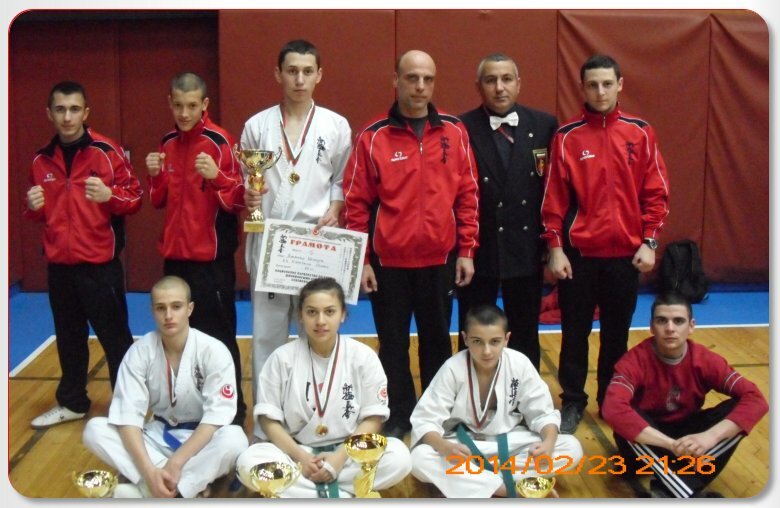 On 23.02.2014 in the "Dan Kolov" hall in Sevlievo was held the National championship in Shinkyokushin karate for juniors in kumite and kata. 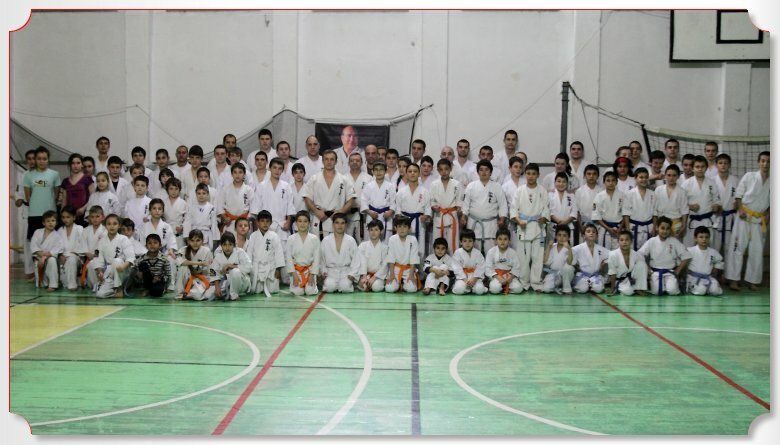 Responsbile for the excellent organization of the evet were the hosts of SC "Kyokushin" Sevlievo. The event was also a qualification for the Junior National Team, which further motivated the fighters and the audience saw many close and attractive matches, many of which ended by vazaari or ippon. SC "Kyokushin" Shumen's competiters made a great performance, winning 2 gold, 1 silver and bronze medals. In the 55kg category Ivelina Petrova came out on top, winning her semifinal against Iordanka Stoianova from SC "Bushido" Nesebar by vazaari after a very strong series of fists and chudan hidza geri. In her final Ivelina decisively won over the experienced Denitza Georgieva of SC "Russe". By referee's decision the award for the best technique was also given to Ivelina Petrova. In the 60kg category Shumen's karateka Dzhaner Shukri did not give his opponents a chance, taking his semifinal by ippon against Julien Radev of SC "Russe" after a well placed djodan hidza geri. In the finals he convicingly defeated his opoonent Dimitar Tumbev of ASKC "Trakia" Plovdiv by vazaari. The republican runner-up in the 55kg category became 14 year old David Aleksanyan, who made an excellent debut in a higher age group, winning his semifinal by vazaari after a very powerful chudan gyaku tzuki. David fought a very close and difficult final match against Metodi Stoichev of SC "Tornado" Pazardzhik, losing to his more experienced opponent in extra time and having to settle with the silver. In juniors kata a bronze medal was won by SC "Kyokushin" Shumen's competitor Grigor Hristov. Strong matches were fought by the rest of Shumen's team as well: Aleksandar Stanchev, Petar Aleksandrov, Viktor Ulianov and Kaloian Georgiev, who all needed just a little bit more to get to the awards. The competitors of SC "Kyokushin" Shumen continue their preparation for the upcoming events from the sports calendar of the Bulgarian Shinkyokushin Karate Federation. On 17.01.2014 SC "Kyokushin" Shumen was host to an exam for a higher level of technique /kyu/ in Shinkyokushin karate. This difficult challenge was undertaken by close to 70 karatekas of Shumen, Novi Pazar, Veliki Preslav and Tzarev Brod, Shumen's representatives being 50. Sensei Hristo Terziev - IV dan /coach of the National teams for juniors and kadets/, sensei Rumen Kalinov - III dan, sensei Daniel Dimitrov - III dan, senpai Stoian Obretenov - II dan and senpai Ivan Bezus - II dan. The exam contained the three fundamental components of Shinkyokushin karate - kihon, kata and kumite, as well as an incredibly difficult physical test. All the participants successfully passed, showing great technical growth, a strong fighting spirit and excellent physical conditioning. The competitors of SC "Kyokushin" Shumen continue their preparation for the upcoming National championships in Shinkyokushin karate for juniors and men and women, which will start off the sports calendar of the Bulgarian Shinkyokushin Karate Federation.